Okay we'll the holiday in itself was absolutely BRILLIANT but there's also one or two people I'd like to point out who completely stood out from the rest, one the holiday representative from Thomson Richard Bottomley okay may I say he was absolutely FABULOUS! Couldn't have gotten anyone better! Absolutely loved him to BITS! Then secondly Leo the entertainer he is absolutely BRILLIANT at his job like seriously come in what other holiday entertainer would dress up as a snowman in 30degree and above heat to do aerobics every week every season every year? Um yeah that's right none.. Honestly couldn't have gotten a better person! Oh and I am majorly jealous of his tan :( the hotel staff where good until one of the receptionists Julio rudely got up and started yelling at me over a simple misunderstanding! I was really impressed with these apartments very nicely decorated very well equipped kettle, toaster, coffee maker, microwave, 2 ring hob, air con at no extra cost. Very powerful shower but drainage very slow which ends up flooding your bathroom. On site supermarket very cheap lots of items cheaper than in the big supermarkets nice 5/10 minute stroll down to the commercial centre were you will find all shops bars and restaurants. A taxi back up to the hotel will cost around 3 euros. I can't comment on the hotel food or entertainment as we didn't stay in. Would I recommend this hotel, yes! Just gutted its full on January 11th 2014 so have book another hotel instead! I have been in Puerto Rico many times, but this was the first stay at this Revoli- and the last. At first it seemed okay. The room we had were nice size. But we had no parasol in our balcony. 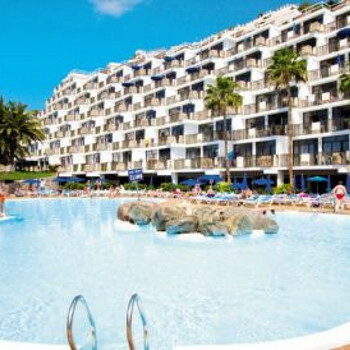 We rented one for the whole holiday, for 33 euro (2 pr. day, and 5 in deposit). But then we realized that we only had cleaning every third day, and only change of sheets and linens ONCE. That is not nice to sleep in, when there is no air-condition. The hotel is supposed to be 4 stars. Another very BIG problem were that all the balconies were just out for a large highway, many times every night we woke up because of the noise. We also noticed, when a man had an accident, the Hotel Staff didn’t know how to give first aid, so one of the guest did it, because they panicked, which was worrying. We have just returned from the Revoli (first time in Gran Canaria). I have to say that we loved the place,very clean,staff are first class (Carlos isnt there anymore,a lass called Becky is there now(although she told me she leaves in a few weeks),but she is good at what she does). Good alround entertainment for kids and adults,(the hypnotist is so funny). We will definetly be going back. We had a good time at this hotel the rooms were spacious and the entertainment was the usual cheesy stuff you get abroad however Carlos was a hoot and gave everyone a laugh. Everyone was friendly and there were no problems with cleanliness of rooms and lifts were always working. For us it was a fine location not too far away from commercial centre (10 minute walk downhill) and we walked back in the evening although could be tough on those with difficulties. Taxis were very cheap (2 euros) for those who couldn't walk it. Did not eat at Revoli as there was a huge choice of cheap restaurants in the centres. We stayed here at the end of April beginning of May. There were three families of us. The apartments are very spacious and clean and the maids do a marvelous job. We never saw any entertainment as it was just beginning for the season. We had a slight problem with the pool side bar , we were never charged the same price twice and had to constantly have our change re checked and money refunded. It is a bit of a walk downhill to the main street and very slidy, not good for anyone with a pushchair or elderly person. The lifts were another major problem they were always broken and never did the two of them work at the same time. It is a long walk up six flights to get out when the lifts are constantly broken. Got this as last minute deal. Hotel is very clean and large pool with plenty of sunbeds. Food from pool bar was cheap and always had good snacks. Good location just down hill to shops and nightlife. Staff and entertainment was ok but went into centre most nights. Stayed at the Revoli in August 06, apartment was clean and roomy. The pool was nice to cool off in as the weather was hot! plenty of sunbeds no need to get up early to get one. Most the staff were friendy. Not much to do during the day if you have children only a few activities, evening entertainment run by the fantastic, funny Carlos. If you like good nightlife go down to the shopping centre (10 mins from hotel)and there are plenty of bars and clubs there (recomend The Garage, Harleys and Snoopy). cheap to eat out, nice food at hotel as well. Would go back had a good stay! This hotel has excellent standards. Staff are friendly especially Carlos.